cryptonaut-in-exile: Unalaska, AK's Officer Shockley writes colorful incident reports. 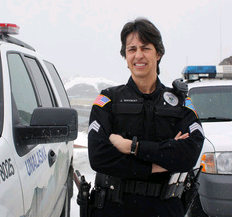 Unalaska, AK's Officer Shockley writes colorful incident reports. Officer Shockley documenting the louts and Whippit kids of Dutch Harbor. Welfare Check (19:23 hrs, 2/22/12) — Caller asked officers to check on two men who were inhaling nitrous oxide from Whippit canisters in the Safeway parking lot. An officer contacted the two men, who claimed they would not be driving after inhaling and would cause no problems this evening. Trespass (23:06 hrs, 2/22/12) — Officers responded to a hotel room where the two Whippit boys were disturbing other guests with their raucous behavior. The two men bemoaned the deterioration in the quality of people now living in the community after they were told they were not allowed to return to the hotel premises.